Many who are new to networking and security wonder what it means to have “ports” open on your computer. Some get rather anxious when an online port scan reveals that something’s open on their system. What follows is a silly, but hopefully memorable way for beginners to remember how nework ports work. Imagine a house with many, many windows. And imagine that all these windows are spring-loaded so they slam shut when they aren’t being actively held open. Also within the house are a number of midgets. 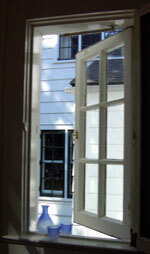 Each one is able to talk to people outside the house temporarily, but only through an open window. Well, ports on a computer — just like spring-loaded windows — are also closed by default. They don’t just stay open on their own. The second someone stops holding one open, it slams shut. So when you do find one that is open, your mission is to find out what little midget program is holding it that way. Don’t worry about the port. It can’t stay open by itself. Instead, focus on the midget.